Best Apps For Travellers To Europe – In a world practically ruled by technology, it’s only right that we utilize it as much as possible. Gone are the days of battling with oversize tourist maps or jumping on a train and hoping we get off at the right stop while traveling to Europe. There’s not even a need to fill in a paper e111 card renewal anymore, with the internet making it easier than ever to apply. There are countless apps available on Android and iPhone that can make our travels easier than ever, and we’re here to introduce you to some of the biggest and best to make your holiday just that little more stress-free. While most of the apps on our list can be used while you are travelling, FlyEurope is ideal for before you even book your holiday. In fact, this app will search airlines and compare the prices to find you the best and most reasonably priced flights for you! You can save time, money and patience by using this app, and trust us – all three of those are valuable to keep! Fly to any of the major European destinations with the cheapest flights and if you have a little more flexibility to go with it? You never know just how little you could spend on your air fare! For those of us who are seasoned travelers or have been abroad at least once and experienced the horror of not having a hire car, you’ll already know how difficult it can be to understand public transport when you’re travelling. Luckily, GoEuro is here to make catching a bus, train or flight so much easier! With easy booking on over 450 travel companies and the best prices, traveling your destination doesn’t have to be a stressful experience. You have all the times, fares and booking you need, right from one little app on your phone! The foodies among you – or, you know, anyone that needs to eat! – will love TheFork. This app helps you find, book and gather special offers for a whole array of different restaurants in Europe. This app is completely free and simple to use, and you could even get up to 50% off of your meal! Look for the right deals on the food that you love using this app and not only will you satisfy your stomach, but your bank account too – after all, saving a little extra cash on food gives you more spending money for those cheesy souvenirs! OneFineStay is an app for those of you who like the finer things in life. If you’re looking for a unique way of staying in the countries you love, this app will help you find the ideal luxury accommodation (usually an apartment or home!) and will even help you settle in. You can browse their selection of homes, check the booked dates, set the address to make it easier to get back there while you’re exploring, and you’ll even have access to plenty of other information like location restaurants and sights to see! TripLingo is everything you could want in a travel app. As the name suggests, it can help you out with the ‘lingo’ of the country you’re visiting with the voice translator feature, and there’s a phrasebook too for those need-to-know features – but the uses don’t stop there! There’s a WiFi dial to let you make international calls when connected to WiFi, a tip calculator so you don’t have the awkward ‘too much or too little’ fiasco, and there’s plenty of culture notes, learning tools, safety advice and so much more to make getting around your destination easier than ever! TripLingo really does have a bit of everything! For us, as for many other travelers, taking a travel guide book with us on trips is a thing of the past. We haven’t traveled with a proper guide book for years, the first reason is that they’re often really heavy, bulky and take up a lot of space in your bag. Secondly, guide books give you so much information about each place, but for us MOST of that really isn’t needed. I don’t want to know EVERYTHING about a place I’m visiting before I’ve even arrived – doesn’t that take away from the excitement? Where is the fun in knowing everything before even arriving?! Guidebooks are great tools to keep yourself updated about the places you’re visiting, and of course you want to know a little bit about the places and what attractions and sites you’ll find. To get all that, you still don’t really need a proper paperback guide book. There are so many alternatives to these that will both save you money and back pain. These days traveling with a laptop is pretty much common place, and although it might seem like it adds on a lot more weight than a guide book does, you know you can store 500 of them and still keep the same weight (among all those other things you would use a laptop for). When traveling, you won’t always have access to the internet to browse online, so guides you can download to your desktop and read whenever you want, are great. You can get a whole guide for only a few bucks, and even the bigger guide book companies are starting to sell their guides in PDF format. Normally the owners at a hostel know everything there is to know about the city for a tourist, and can tell you what there is to see around the place, all from good eats to temples to clubs. I don’t actually have a smartphone myself, but I have an iPod Touch and that works great. What’s great about these apps is that you can bring them with you onto the street, and many of them don’t even need an internet connection to work. Just search for guides or the places you’ll be going and see what you can find. Many country tourism authorities have created great free apps for cities and places, this is becoming more and more common place. Just a click away, the internet is probably the easiest way to find out what you need about the city you’re visiting. Websites like Travel fish are great for finding things to do, restaurants and places to stay – and finding out the truth about them by people who have actually been there. There are also tons of travel blogs that have heaps of great guides and information about places. Random Walks – Find Out Yourself. Some days, it’s better to just take a look yourself on what there is to do and see around you. Take a walk down the street and you’ll most likely end up somewhere you haven’t been before, and see something new that you haven’t seen before, whether it’s a market, some shops, a river or a temple. Sometimes the best attractions aren’t those mentioned in the guide books, but those experienced by a random moment on a random street in a random city – somewhere around the world. How do you get around new cities? If you have any tips on places to get some good guides and information, we’d love to hear about it! I’m not a religious person, in fact, I quit the automatic-at-birth church membership they sign you up for in Sweden last year. However, I’ve always enjoyed visiting churches, I feel that there is something special about them, something very comforting. I feel safe and calm when I’m sitting in a church. For me it is the same as with guide books – they’re comforting and it makes me feel slightly safer with one in my hand, but I never really read them. It’s not the guidebooks themselves that are the problem for me, but the way some people read them – as if they were the bible. Now I kind of like the bible as well, it shares some really amazing stuff for living a happy life, but just as with the Lonely Planet guides (and other guides), many people misread and/or read too far into it. 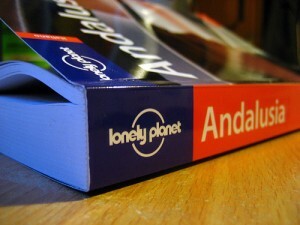 So, what they both have in common, The Bible and Lonely Planet – is that they’re both guide books. They’re there to share with you some guidelines to help you on your way, not for you to follow strictly from point A to point B. We see people all around the world, sitting in cafes, walking down the street with their heads stuck so deep inside a Lonely Planet guide book, that they seem to forget to simply just look around at where they are and enjoy. Guide books are there to give you hints, but it’s your task to make up your own way of doing it – there are no ‘must do’s’, or ‘must-see’s’. He never once mentioned HIS personal experience, and when I asked him he didn’t really have anything to say about it – for him it was all about the list. Now just to make things clear, I don’t think that there is anything wrong with having bucket lists, in fact I love them! If it’s a list of things you really want to do, rather than a list of things you feel that you must do because everyone says so, then go and enjoy yourself while ticking off your personal bucket list. But if you’re running around stressing to see everything, I don’t think you’ll get the most out of your stay, even if you saw more things than me. What’s the point of living a life if it’s already decided by somebody else how you should live it? What’s the point of exploring if someone else halve already told you all about it and what to expect? What adventure is worth doing when you already know what’s going to happen? It’s like opening a Christmas present you knew you would get. What I love about online travel guides and guides written by fellow bloggers is that they’re brief, straight to the point and only write about the most necessary information. So, let yourself go, trust and have a little faith in YOURSELF, not in the book – who knows maybe you will have fun! You learn a lot when you go traveling, especially from the people you meet along the way. Out of all the places I’ve been, there is no place where I’ve learned so much about human beings as when we were in Vanuatu. Despite being one of the poorest countries in the world, these people have been rated the happiest in the world. You shouldn’t believe everything people say about rankings, so we went there to check the out and have to admit that these people really do have something that most of Western society seems to have lost. The way they lived reminded me of many things I already knew but so rarely actually saw, or did in real life, so for that I am so very grateful. We came across this wall in the middle of nowhere, while explore an island in Vanuatu – I think it really sums up the mindset of the Vanuatu People. These people will trust anyone and everyone for no apparent reason. For example when we were going to buy some bananas from a market lady, she was lying under the table on a mattress fast asleep. We had to wake her up, show her that we wanted to buy the bananas, but even then she just waved her hands towards the table and told us to put the money somewhere on her table, and fell back to sleep. That kind of thing would never happen in a Western country, where the focus seems to be more on let’s make more money and trust nobody until they prove it. My mouth was literally aching after spending a few days in Vanuatu. This wasn’t just because we were tourist either, they also acted the same to each other. They were polite and friendly without wanting something back. Here in Europe, people often are only polite if they get something out of it, and they get very confused and at first a little suspicious if you’re friendly and talkative to them for no ‘reason’. There it was more strange if you DIDN’T talk to the person sitting next to you in the bus van. In the Western society I often feel like people judge you if you’re not always doing something, or always busy. The first thing people always ask me is what I’ve done lately and what my plans are for the future. The vibe in Vanuatu was so chill. It really felt like time stood still, and you could find people just sitting under palm trees, laughing or sleeping by their food stalls in the middle of the day – enjoying life. Taking the time to help a stranger is something that is so valued there, and I’ve never seen people putting in such a big effort to help you without asking for something back in return (like some tip). In many other places you will find people are simply way too busy with their own lives to stop and care for someone else’s. Coming from Sweden, we ‘need’ a very large ‘personal space bubble’. Often we feel uncomfortable even when someone sits in the seat next to us on a bus. Unless the bus is full, you will rarely see two strangers sitting next to each other when there are other free seats. I did it once to test, and the person next to me was very uncomfortable, and moved away. Here in Vanuatu people sit right down in the seat right next to you in an empty bus, look at you with a big smile of their faces and starts a conversation right away. They are honestly curious about you, and really care to get to know you as a human being.